THE CHURCH IN FRIAR PARK has stood from the beginning in what has come to be known as the 'Anglo-Catholic' tradition of the Church of England and today is in the care of the Bishop of Ebbsfleet, The Right Reverend Jonathan Goodall, an assistant to the Archbishop of Canterbury whose remit is to care for those parishes which seek to maintain the historic ministry of the Church of England. 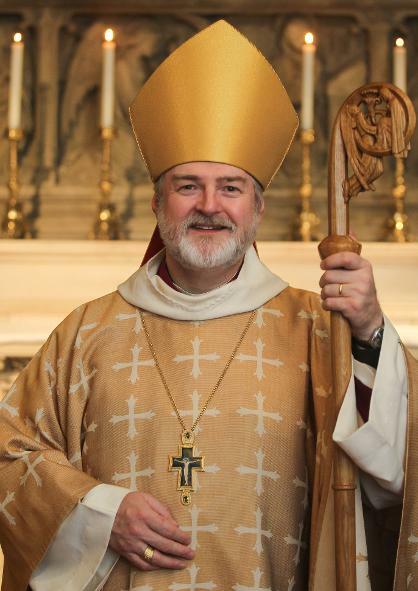 Do pray for Bishop Jonathan (pictured below), and for the parishes and people in his care; you can find a list of his parishes and clergy if you click on the See of Ebbsfleet logo on the Links page. And remember as well the Bishops of Lichfield and Wolverhampton. Central to our worship here in Friar Park is the celebration of the Mass (the service also known as the Eucharist, or the Holy Communion, or the Lord's Supper in other traditions), and we recognise the importance of all Seven Sacraments of the Church* in our growing relationship with God. Because the Mass is so central, we offer it almost ever day - so if you can't get to Church on a Sunday we have regular Masses, morning and evening, during the course of the week. So many people are conscious of carrying burdens of guilt from the past which affect their present life and hinder any moving forward. If this is so, here at Saint Francis' the Church of England's Ministry of Reconciliation is freely available. Sometimes called 'Confession and Absolution' this gentle ministry is grounded in Scripture - the gospel words of Jesus commissioning his first apostles to forgive sin, and the Letter of Saint James where the apostle counsels confessing our sins to one another. Just talk to Father and he will arrange a convenient time to meet with you. Confession is a part of the Church's wider Ministry of Healing, which also forms part of our common life here in Friar Park, where the sick receive the Laying on of Hands and are anointed with the Oil for the Sick which our bishop blesses for this use. by clicking on one of the tabs at the top of the page.